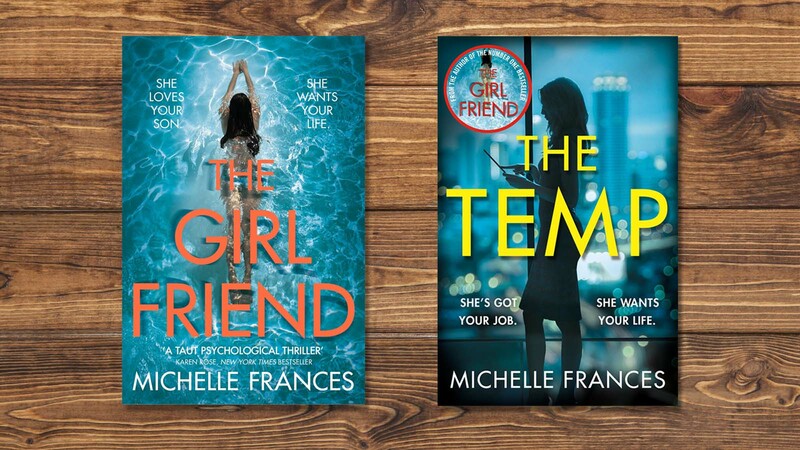 Michelle Frances, author of last summer’s smash hit The Girlfriend, answers some questions about her new book, The Temp, which is available to pre order now. In your best-selling first novel, The Girlfriend, and your second book, The Temp, you write about fraught relationships between strong female characters. What is it that draws you to write about these dynamics? I love writing about fraught relationships, regardless of whether they are between women or men! At the heart of both of the books’ stories is fear. In The Girlfriend, it's the fear that you are losing your son or your boyfriend, and in The Temp, the fear that you have made the wrong decision about your baby and you are losing your job and possibly your husband to a ruthlessly ambitious young upstart. I’m also fascinated by how psychotic tendencies in people can become dangerously exacerbated when they feel threatened, characteristics that also appear in both books. From the two books you've written so far, who is your favourite character? I have a soft spot for the two younger women in each of the books: Cherry in The Girlfriend and Emma in The Temp. Both are struggling to get a foothold in life. In Cherry’s case, she’s a classic victim of intergenerational unfairness – for her there’s no state certainty of a safety net and a pension. Even the idea of owning her own home is a distant dream. These challenges echo what young people are having to face today and in fact many will be worse off than their parents. Emma comes from a more affluent background but her parents have stopped supporting her financially and she’s fighting against some horrific unfairness in her workplace to stay afloat. Why do you think there is so much competition among women in the workplace? I don’t think competition in the workplace is exclusive to women – in my experience some men are even more ruthlessly competitive! But men usually don’t take a long period of paternity leave. Being away from your job that you love, particularly when it’s in a competitive industry can be unnerving. During my research for this novel, I came across some jaw-dropping stories. Women who were replaced by the shiny new temp cover while they were at home looking after their babies – in some cases the replacement being the person they had once hired as their assistant! Others were overlooked for promotion during their pregnancy, some even pressured to have an abortion. It’s no wonder that women can feel insecure in the workplace if they don’t feel supported when they decide to have a family. How was writing The Temp different from writing The Girlfriend? Well there was the nervousness of actually being commissioned to write something (rather than writing on spec) but other than that it was remarkably similar. At the start of the process there’s the joy of the blue-sky thinking, dreaming up big story arcs and inventing characters and thinking you have all the time in the world. Here’s where you allow yourself trips to the seaside in the name of research. Then there’s the excitement of seeing the story start to take shape. About two-thirds the way through, I got a bit of a wobble thinking I may not have enough material but then – pow! – the character of Emma decided to take a dangerous turn and I absolutely loved writing the last few chapters – as I did with The Girlfriend – where the tension really racks up through to the finale. My next book is a ‘David and Goliath’ story about a woman who is fighting for justice for her daughter. The Temp is a twisting thriller about ambition, deception and betrayal, guaranteed to keep you hooked, just like The Girlfriend did. The new book from Michelle Frances is published in paperback, ebook and audiobook on 20th September 2018, and is available to pre-order now.